Brooklyn-based studio Crème employed traditional Chinese dying techniques to create these indigo-coloured wooden chairs for Stellar Works. To celebrate the launch of its Exchange Collection for Chinese brand Stellar Works at this year's ICFF, Crème created limited-edition versions of the range's chair in distinctive blue hues. 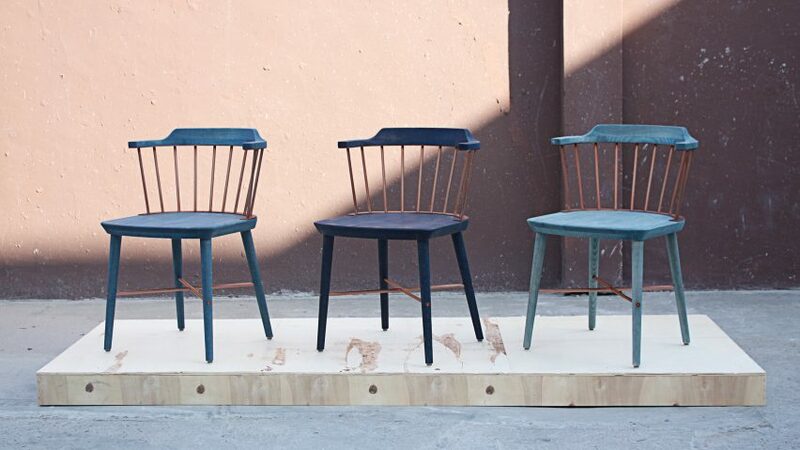 The Special Edition Indigo Exchange includes three chairs dyed in different shades of blue. The chairs feature copper supports that are intended to offset the blue-hued wood. To create the blue colouring, the designers worked with producers of natural indigo dye in the Guizhou village in southern China. The dye was organically grown and harvested by local villagers before being applied with traditional hand-dyeing techniques. Among these was batik, a technique commonly used to dye cloth by applying wax to protect some areas from colour. Its effects can be observed in a fourth version of the chair that is only half dyed. "The development of the special-edition indigo chair has been a very rewarding process as it captures the essence of Chinese craft heritage and handmade production processes within a contemporary piece of furniture," said CEO and founder of Stellar Works Yuichiro Hori. Crème designed the limited-edition blue chairs to coincide with the launch of its expanded Exchange collection for Stellar Works. The collection began with last year's Exchange chair, which is based on the Windsor seat. It features a curved back support attached to the seat with upright rods secured by drill holes. To add a contemporary update to its traditional predecessor, the designers swapped both the vertical support rods and the ones that crisscross at the base for steel rather than wood. Made of solid wood and blackened steel, the new additions to the range include a dining chair, a lounge chair with a cushion, a high-back chair, a two-seater and two types of bar chair. There is also a dining table with thick legs. The Exchange collection was awarded best collection in ICFF's Editor's Awards. ICFF, also known as the International Contemporary Furniture Fair, took place from 21 to 24 May 2017 as part of the city's NYCxDesign festival. Stellar Works launched as a design brand in Hong Kong in 2011. Last year, it launched the Valet range by American designer and architect David Rockwell during Milan design week, following a wider trend of Chinese brands exhibiting at the event.